If there was a theme to last week it was PICKLES. Pickle sales tend to come in waves, with the last big peak right around Christmas. 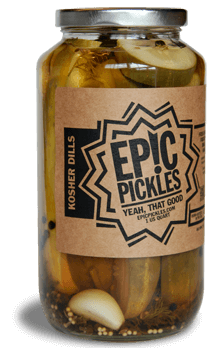 No surprise there, since Epic Pickles make epic gifts (sorry…), but it got me wondering about the sudden surge now. Did everyone who stocked up around Christmas just happen to run out at the same time? Is there a pickle-St Patty’s Day connection I’m not familiar with? Or…what? But I didn’t wonder too long, when I realized on Monday that between us, Dusty and I had eaten all the pickles in the house, with a big jump in consumption just in the preceding few days. Now, maybe for us, this was the power of suggestion — we saw all of you buying pickles and thought, “Those look good!” (This happens a lot, that we’ll talk to one of you about something you’re planning to make with your market haul and then we find we just have to do the same thing!) Maybe there was just one pickle trendsetter last weekend — they bought a jar, told their friends, their friends bought a jar, told their friends….and before you know it, we’d sold more than double a normal weekend’s worth of pickles. I don’t think so, though. I think we all independently started craving pickles because they are a great way to get a zing of freshness and crispness before it’s available *actually* fresh. It’ll probably be at least two and a half months before we have fresh cucumbers coming in from the farms, a few less weeks for asparagus, a few more weeks for green beans. For now, though,our selection of greens continues to grow — this week we even have braising-sized kale and collards from Village Acres!